Starring Zach Tyler, Mae Whitman, Jack De Sena, Dee Bradley Baker, Dante Basco, Jessie Flower, and Mako. The mark of a good story intended for children is that adults can find it interesting as well. I still enjoy the Hobbit, and I appreciated the Narnia books much more once I was an adult. These stories, and many more like them, contain enough depth to satisfy a thoughtful reader while remaining accessible to almost everyone. There has been no greater curse upon our children than the rise of controlled vocabulary reader, containing nothing more advanced than the average knowledge of the targeted age-group, and usually insipid to boot. I never gave The Last Airbender a chance because I assumed it would be a typical cartoon. In retrospect, this was unfair. I have liked many of the Nicktoons, going all the way back to Ren & Stimpy. Nickelodeon has managed to produce a remarkable number of children's shows that are watchable by adults. Sometimes, they have perhaps gone too far. Ren & Stimpy and Invader Zim were often bizarre and macabre, violating established canons of good taste in search of a gag. Yet these are shows also have the most enduring popularity. They are the kind of cartoons Dads love and Moms hate. This show strikes a balance between humor and good taste that should satisfy almost any reasonable person. The Magistra and I laughed often. Yet The Last Airbender is also didactic in the best way. It almost never descends into preachiness [almost]. The dramatic arc of the show allows for genuine moral dilemmas. Given the brutal history of the world in which the show is set, these dilemmas often focus on revenge. Almost everyone has a score to settle with someone. The really interesting part is that most of these complaints are completely justified. At lot of people really do deserve to die. Now you you have your enemy at your mercy, what do you do? This world of war and injustice means that strife is endemic. The combat is largely bloodless, but I was surprised by just how many characters died offscreen. Death is a constant for everyone. The Last Airbender confronts death directly. It is amazingly intense. Yet never forced. I have never seen such a touching memorial for a lost son. The Magistra also cried a lot. 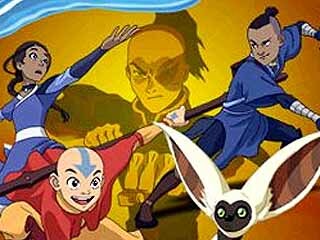 While The Last Airbender is an American cartoon, it borrows from anime for its style and conventions. It even has a beach episode. The world is generically Asiatic, ranging from the Nepalese Airbenders to the Siberian Waterbenders. The bulk of the atmosphere comes from China, however. The martial arts, the overall mythology, the scenic mountain vistas are all Chinese. I approve of this borrowing, since the Han are one of the great civilizations of the world, and deserve to be honored in this way. Unlike a great many anime series, The Last Airbender managed to stick to the story, and followed the arc to its end in 61 episodes. This itself is a remarkable achievement, so many series get lost on the way to their destination. I can understand why this is so. 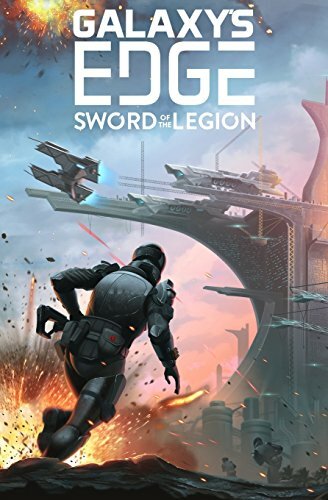 I wanted it to be longer, and I was sad when the story ended. But I was happy too, because it ended so well. Having the discipline to end it while the ending is good is an essential part of storytelling. I would be glad to share this show with my own children. It is a rousing good yarn, with astute judgements about human character, and sound moral reasoning. One of the best cartoons I have ever seen. Borrowing an idea from Jimmy Akin, this is not a top ten list, because there is no way for me to definitely rank the ten best anime, but rather these are ten titles that are notable works of popular art. My offhand comment about Samurai Champloo not making my top ten list got me wondering just which 10 anime I would select. Here they are. Cowboy Bebop is Shinichiro Watanabe's first, and it is a hard act to follow. The combination of creative Jeet Kun Do fights, a jazz- and blues-inspired soundtrack, and the ever popular Megumi Hayashibara made it a huge success. The episodic nature of the series makes it easy to get into. You can pick up almost anywhere and not miss too much. The downside is the story is pretty thin, and dribbles out slowly. The movie, Knockin' on Heaven's Door, is also engaging. I can remember coming home to my dorm room and finding my roommate and several of his friends watching it [subtitled even], despite none of them having an interest in anime. This alone makes Cowboy Bebop worthy of inclusion in a ten top list, because anime is not noted for its broad appeal. One of the most popular, and strangest anime ever made. It is famously obscure, and the original incarnation was indubitably affected by the director's (Hideaki Anno) depression and the sarin gas attacks. As the original series progressed, it got stranger and stranger, leading to incredibly hostile fan mail (some of which was actually included in the End of Evangelion movie). These elements have served to make the series more popular rather than less. A lesser anime would have been doomed by this, but Eva plays well upon occult/conspiracy fascinations, and builds upon a richly detailed backstory infused with Kabbalistic and Christian themes. Eva is one of the most thought-provoking animes I have ever seen, so it merits inclusion despite being so grim as to be largely unenjoyable. 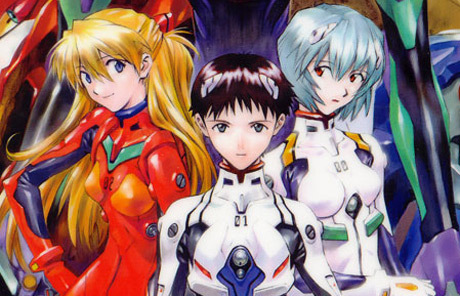 The new reboot of Eva that is currently being released has promise to keep the best elements and eliminate the worst, so hopefully Eva will get even better. If I were going to use an anime to teach just war doctrine, this would be it. I could probably make a separate entry for the Kenshin OVA, since the series and the OVA are so different in style and tone, but I prefer to regard both works as a unified whole, since the light-hearted Kenshin of the series cannot be truly appreciated without knowing the humorless revolutionary of the OVA. The OVA is beautiful and heartbreaking, the animation is of remarkable quality. I have never seen anything else that can make violence so beautiful. It makes the Magistra cry everytime. The visual quality of the anime is variable. There are a few episodes that are truly terrible to see. However, what truly makes the series great is the historical context and the stylized, over-the-top fights. This is an anime you actually could learn history from. The Shinshengumi, the Ishin Shishi, the Sekihotai, all groups of real people who strove for dominance at the beginning of the Meiji era. The spirit of the martial arts of Japan really comes through in this anime. The single-minded intensity and unshakeable superiority of the various warriors that Kenshin fights are an accurate rendition of the hubris that led Japan into WWII. GAINAX has had three recent series, FLCL, Abenobashi Mahou Shotengai, and Gurren Lagann, that have attempted to tell a story hidden behind brutal satire of the hidebound conventions of anime. Gurren Lagann is the greatest of these three. I thought Gurren Lagann was hilarious, but then I watched GAINAX's eariler classic Gunbuster recently and realized just how much funnier it can get. I'm not really a devotee of the mecha genre, so I didn't fully appreciate how Gurren Lagann is not really much of an exaggeration of the typical mecha anime. What strikes me about Gurren Lagann is the philosophical subtlety. At first blush, Kamina's "don't believe in yourself, believe in me who believes in you" sounds incredibly stupid. And Kamina is incredibly stupid, but he is invincibly stupid, which gives him great powers. Believing in yourself is about the worst thing that can happen to you, as Chesterton pointed out in Orthodoxy. Only the mad truly believe in themselves. The best the rest of can do is muddle through, but we are not alone in muddling. Kamina's statement is one of the best expressions of human solidarity I have ever heard. This list is GAINAX heavy, but what can I say? GAINAX is one of the best in the business. I could probably put more than one Miyazaki film on here too, I just didn't. FLCL is only 6 episodes, and this is one of its strengths. As I get older, it is harder to get up the gumption to watch a series, especially a really long one. I appreciate movies and OVAs more and more. Each of the 6 episodes of FLCL is completely different, using crazy combinations of genre parodies and animation styles. However, it all ties together into a whole seamlessly. And I find it hilarious. Japanese only has 53 phonemes, so it has a lot of homonyms. This makes Japanese incredibly punny, and FLCL takes this to extremes. The series is incredibly surreal, and it can be very hard to follow. Each episode manages to tell its part of the story while simultaneously serving as a self-contained sendup of some bit of Japanese nerdiness. I had to watch it several times before I really knew what was going on, but the animation is good enough to repay multiple viewings. 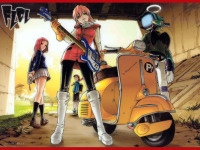 FLCL is yet another anime with an excellent soundtrack, this one mostly by the Pillows, that helps to make this more than just another cartoon. Hayao Miyazaki could almost populate this list by himself. One of the greatest storytellers of the medium, Miyazaki is a master of sweet, evocative tales with environmental themes featuring tough, strong heroines. Spirited Away is Miyazaki's paean to Shinto. In this it shares some elements with Mononoke Hime, but it is less frightening. This story is sweeter and less grim. It definitely has a bit of scariness about it, but I think this is a good movie for children who don't get nightmares easily. The reason for this is the more I watch this movie the more I get out of it. At first I didn't appreciate Chihiro's personal journey, but she really did start as an clingy and whiny, and she ended up strong and self-reliant. There are good life lessons here. Unspeakably sad and beautiful, Metropolis is based on Osamu Tezuka's adaption of Fritz Lang's masterpiece. This movie is closer to the silent movie than Tezuka's manga was, but you can clearly see both styles blended, the Disney-inspired characters populating the dystopian, Art Nouveau great city. In addition to its beautiful imagery, Metropolis has a New Orleans jazz soundtrack that is oddly appropriate. This is a story that combines the grandeur and self-confidence of fin-de-siècle Europe with the grim, world-altering purpose of the Fascists and Socialists. I see Metropolis as a capsule history of the first half of the twentieth century. Class struggle, technological hubris, weapons of mass destruction, it is all here. I also wish planes like the ones in this anime really flew! They would be way more comfortable. One of the best uses of the animated medium ever, and the best of Satoshi Kon's work. Perfect Blue was his first, and Paprika is literally surreal, but Millennium Actress brings a tear to my eye every time. This movie is simply perfect. It does exactly what it tries to do, tell the story of an entire life through the movie roles Chiyoko Fujiwara played. Animation allows for a completely seamless transition between the lives Chiyoko played and the life she lived, such that you cannot tell which is which. This is entirely appropriate, because she poured herself entirely into her characters, such that the boundaries became blurred. This movie also serves as a history of a long lifetime in Japan, one in which everything changed utterly. The Japanese people experienced a series of upheavals after the Meiji Restoration that were as unsettling and radical as the Tokugawa Era was unchanging. These changes were so rapid that one person could experience everything from the end of the Shogunate to the dropping of the atomic bomb. Chiyoko lives a bit later than this long timetime, but nonetheless the Japan of 1990 and 1930 are in some ways more than 60 years apart. 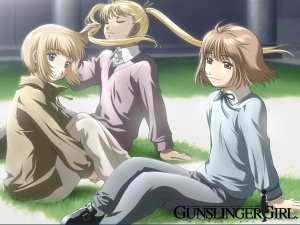 I already had my say about Gunslinger Girl. Beautifully done, historically inspired, psychologically subtle. Definitely a favorite. Azumanga Daioh is the only one on this list that doesn't involve someone dying (unless you count Yukari-sensei's driving). This is a slice of life style anime, focusing on the lives of a group of high school girls and their crazy teachers. It has some bizarre elements, but for the most part it is just about the weird things that happen in life. The manga this series is based on is actually done in a newspaper 4-panel style. Once you see the manga, the format of the series becomes understandable. There are a lot of rapid-fire jokes that come and go, and I think this is due the nature of the source material, which the anime follows closely. The best part is the interaction of the two teachers, Yukari ゆかり and Nyamo にゃも. Perfectly opposed in personality, yet somehow believably friends, Yukari and Nyamo seem very much like real people. They each have strengths, weaknesses, quirks, and foibles that make them seem totally normal. Excellent characterization and a keen eye for the absurdity of life make this anime worth seeing. Another oldie but goodie from Studio Ghibli. 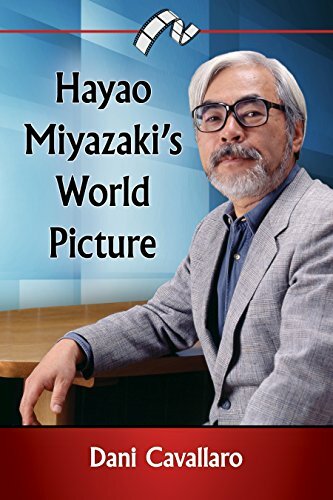 This is one of the few movies by Miyazaki that does not feature a female protagonist, although we do see lots of character types that show up in his other movies. This movie really made me want to go see the Adriatic Sea, it was protrayed so beautifully. It also evoked a powerful sense of nostalgia for that brief peaceful interlude between the two World Wars, before all the dreams were shattered. This is probably one of the most adult of Miyazaki's movies, and by that I suppose you could substitute mature. Even though it was lighthearted and sweet, there was still a hint of the terrible scars left by the Great War, and the ominous foreboding of the greater war to come. The planes, and especially the plane factory, are very well done. I'm not an aeronautical engineer, but this bit felt right to me. Cute, with a catchy soundtrack, but ultimately confusing for me because this was a sequel to an anime that came out 20 years ago. I generally like pretty much everything that GAINAX puts out, but this anime was a bit too self-referential for its own good. It is dangerous for a niche product like this to become sensible only to super anime nerds. It is acceptable for movies to be self-referential because they are a genuinely demotic art form, and generally the writers are wise enough to make the movie work on enough levels that you don't have to get the reference to enjoy the movie. Ranting aside, I did enjoy this anime, although I probably would not have watched it other than it was by GAINAX. The animation style reminded me strongly of FLCL, particularly in action sequences. Typical giant robot believe in yourself anime B.S.